A firm favorite for many years, a Little Mermaid party can make your little girl feel just like a princess in her own under the sea party! With a few great Little Mermaid birthday party ideas, you will have a party that not even Ursula can put a damper on! If the weather is agreeable, a pool party is a great choice for a Little Mermaid birthday party. 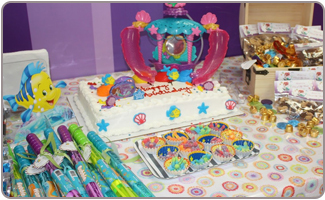 An indoor party at an area center or YMCA can let your little mermaids splash happily no matter what the season. Plan the party at least 6 weeks in advance of your desired date so that you can give everyone ample time to make their own plans to attend. 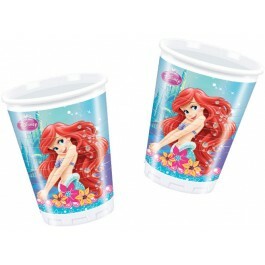 Purchase your Little Mermaid birthday party supplies a minimum of 4 weeks in advance so that you can ensure you receive your supplies with plenty of time to spare. 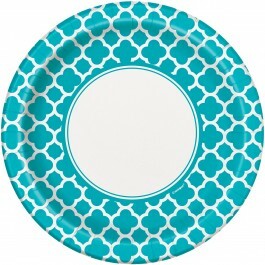 This will also give you plenty of time to order additional items if you realize that you could use more cups, plates, or even more Little Mermaid return gifts. Some of the most popular Little Mermaid party ideas include hosting a slumber party, featuring the Little Mermaid movie, and other mermaid-themed movies for entertainment. Get a copy of The Little Mermaid soundtrack to play during the party and let the birthday girl be dressed in a lil mermaid costume. Purchase large seashells from a craft store, or collect them from the beach if you live near the ocean. 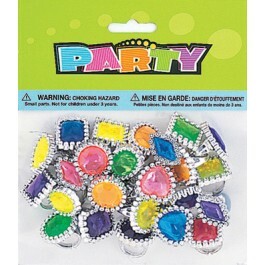 Wash and dry the shells thoroughly and write the party details on the shells. Either hand-deliver the invitations or mail them in padded envelopes. You can also choose to tie a tag on the shells instead of writing on the shells. Use a template of Ariel's fish friend Flounder to trace and cut out Flounder-shaped invitations from colored construction paper. Use a glue stick and glitter to embellish the invitation, writing your party details in the center of the little fish invitation. 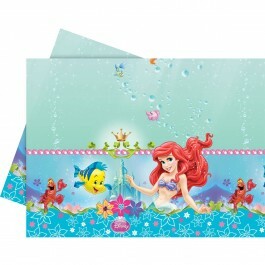 Our selection of Little Mermaid birthday party prepackaged and printed invitations can save you some time and let you pick out invitations that perfectly match the rest of your Little Mermaid party supplies. Recycle old soda bottles, or purchase small glass bottles from your craft store, write your party details on a piece of construction paper that has been decorated with Little Mermaid-themed embellishments. Stickers, die-cuts and seashells can transform your invitations. Add a vintage look to the paper by first soaking it in a solution of tea and allowing the paper to dry. Roll up the invitations and seal them in the bottle with a cork. Consider adding foil stars or seashells along with the message in the bottle. No matter which invitation option you go with, use adorable Little Mermaid stickers to add a fun touch and decorative seal to the envelopes. Pin the scepter on Ursula is a fun twist on the traditional pin the tail on the donkey party game, and gives the little mermaids an opportunity to get their revenge on this wicked sea villain! 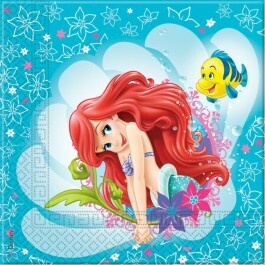 An alternative to this could be pinning the flower on Ariel or give Ariel a shimmering seashell. With the Little Mermaid soundtrack playing in the background, a limbo game is a fun beach-themed game to play. A treasure hunt that includes a map of how to find the hunt items can keep kids of all ages busy and entertained. A treasure chest filled with Little Mermaid return gifts and gold foil covered chocolate coins can be the final treasure for all of the kids to discover. 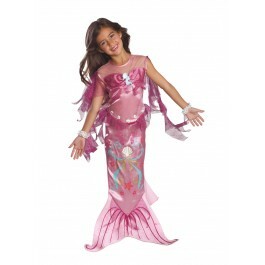 Mermaid tailraces, which are similar to potato sack races, can be super fun for the little mermaids and mermen! Use pieces of green tulle to tie at their knees so that the kids have to hop and jump their way to the finish line! Play the Under the Sea song while the kids dance their silliest moves, when the music stops the last person still moving is out of the game. The winner gets chocolate gold coins as their prize! 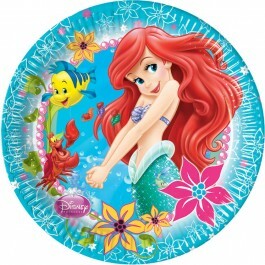 Little Mermaid stickers and sticker books, along with a small package of crayons and Little Mermaid coloring books, pens stickers, tattoos can inspire creativity. 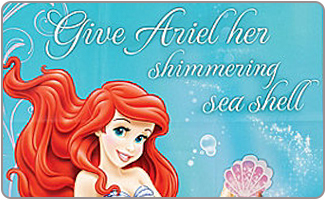 Bath gel, along with glittered body lotion and lip-gloss is just what every little mermaid wants to feel her best! 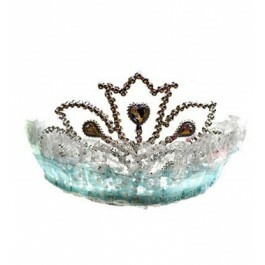 Costume jewelry, along with a brush and mirror can get your little sea princesses feeling like true royalty. 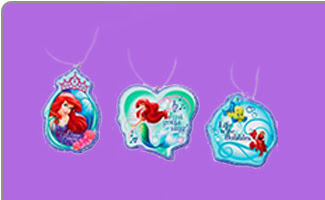 Scented bubbles, along with Little Mermaid blowouts are a must-have for any Little Mermaid birthday party. Ocean themed candy and lollipops will give them a sweet treat for later. Make blue Jello in clear glasses, with gummy fish inside of each cup. Alternatively, you can use fish or star-shaped molds to make your themed Jello snacks. Some other Little Mermaid party ideas for snacks include goldfish crackers, gummy fish, gummy sharks, and chocolate seashells and turtles. Seashell shaped pasta, served with your favorite pasta sauce and meatballs, makes a great main course. Star-shaped chicken nuggets offer an alternative to the meatballs. And, if you're feeling creative, add a few drops of green food coloring to the pasta to transform them into seaweed pasta! Use cookie cutters to create ocean-themed shapes in your sandwiches and even slices of cheese. Fish, seashells, and even a tiara could be a good choice for shapes. A Little Mermaid themed cake is a must-have for this Little Mermaid party. 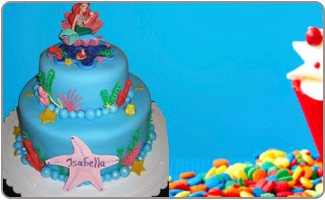 A sheet cake with a selection of our Little Mermaid cake decorations can be just the thing the party needs. Alternatively, a tray of cupcakes topped with Little Mermaid cake decorations will allow everyone their own perfect-portion! 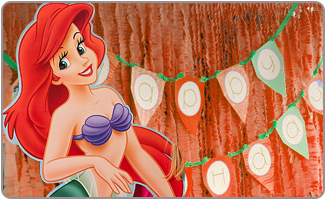 Some Little Mermaid party ideas for decorating the outside of your house could include large Ariel Mylar balloons with a mix of party balloons along with posters of some of the other characters from the movie; Flounder, Sebastian, Prince Eric, Ursula, and King Triton, for example. Use driveway chalk to decorate your driveway and pathway with pictures of starfish, seaweed, and other ocean-themed drawings. A bubble machine can create the perfect ambience for your underwater adventure! Rent a bubble machine from a party supply store and keep the bubbles going. This can be used both indoors and outdoors. Cover lights with blue cellophane paper to create a blue hue to the party festivities. 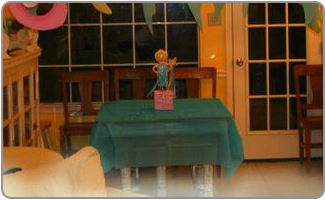 Use cut outs and posters of sea creatures and characters from the movie to decorate the party. 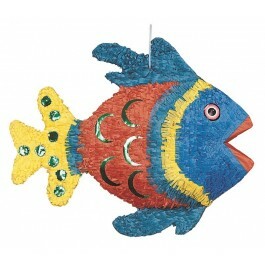 Be sure to suspect a few starfish and fish from the ceiling, along with strips of green streamers to look like seaweed. The green streamers can also be used to create a seaweed forest in the doorway, attach a few cutouts of fish to the streamers to give the impression of swimming fish. Some Little Mermaid party ideas for covering the tables include using Little Mermaid party tablecloths, along with cups, paper plates, and napkins from our collection. Alternatively, you can use a solid blue tablecloth. Use cheap fish bowls and fill them with green tissue paper and a few small-size plush toys of the movie's characters. These can later also then be used as return gifts.